Kvemo Svaneti is located in the north-west of Georgia and borders the disputed, and currently Russian-controlled, Abkhazia. The region, one of the most beautiful and biologically diverse in a country famed for its beauty and biological diversity, is home to the Svanetian people. Svans, despite being classified as Georgians, maintain their own history, culture and language and, as any Georgian will tell you, Svaneti is far from your typical region of Georgia. The geography of the region is characterised by its height (it is one of the highest regions in Europe, at 700-2,200 metres above sea level), as well as by the glacial Caucasian peaks that dominate its views and its deep mountain gorges. However, it is the forests of Kvemo Svaneti which provide the structure, wealth and biodiversity of the region. But all is not well in this mountainous Eden: since the collapse of the Soviet Union in 1990 Svan forests in particular, and Georgian forests in general, have been under siege. After the break-up of the Soviet Union in 1990 and Georgia’s independence, the flow of cheap Russian timber dried up almost instantaneously. As the Forestry Department’s dwindling budget constricted its capacity to function throughout the 1990s, the black market moved in to take up the slack. By 2000, despite the ratification of eight separate international conventions concerning the protection of forests, Georgia had a booming trade in illegal logging. While export limits were set at 780,000 m3 of timber, the black market was exporting anywhere between 2,500,00 and 6,000,000 m3 of timber annually. 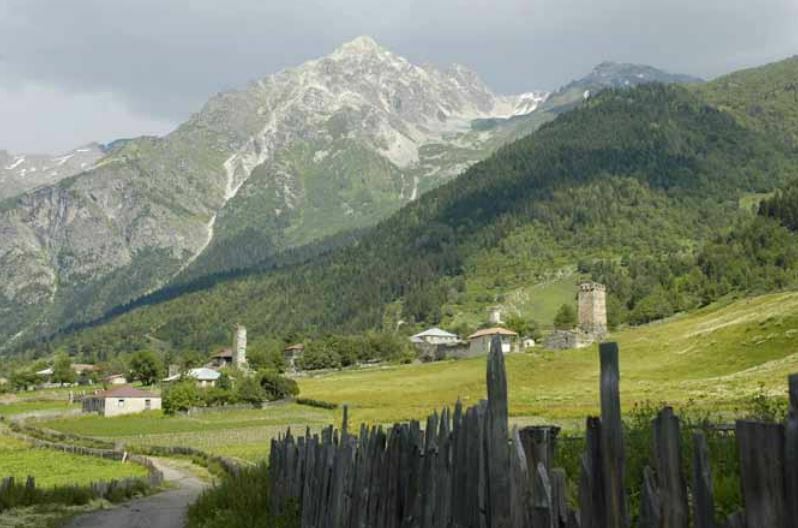 Svaneti, a largely lawless region throughout the 1990s, suffered the brunt of this ecological assault. After the 2003 Rose Revolution there were improvements. In 2004 the arrest of the head of the Adigeni forestry region, on corruption charges, and large-scale reform of the police department, appeared to signal a new beginning. By 2007, however, things began to deteriorate again. Attempts to privatise the management and maintenance of forests ended in disaster, with the loss of around 1,000 Forestry Department jobs and cancellation of the World Bank’s seven-year, 15 million US dollar Georgian Forests Development Project only two years from completion. These problems coincided with another round of forest licence sales, all of which were snapped up by the only bidder, Georgian Wood and Industrial Development Co. Ltd, a joint Chinese-Georgian company riddled with former Forestry Department employees. Although some clampdowns on outright illegal logging have occurred, they have been replaced by a high-level revolving door between government and private logging companies, a door that, to this day, remains open to business. In Kvemo Svaneti the problem is more serious still, as the degradation of forests is driving damaging positive feedback loops which encompass economic, environmental and cultural factors. Deforestation is being driven not only by illegal and poorly managed legal logging, but also by the activities of the local communities. The collection of firewood and the grazing of livestock on deforested areas in particular are compounding the problem. However, these actions are themselves caused by a lack of economic options in the region, as tourism is turned away by the loss of forested areas and biodiversity and areas for the cultivation and collection of non-timber forest products (NTFPs) are removed. Furthermore, as the economic situation stagnates young people are driven out of the region to search for serious employment opportunities, decreasing the economic flexibility of the area. The longer deforestation continues the more local communities are locked into a bi-sector, environmentally damaging economy which is excluded from value-added goods and sectors, such as NTFPs and tourism. In addition to the economic problems, deforestation is also fuelling large-scale environmental damage to the region. As the tree roots hold the soil together and prevent landslides, the cover the leaves provide mitigates soil and land erosion. Over the last 20 years the area affected by landslides in Kvemo Svaneti has increased by over 40 per cent. The damage caused typically manifests itself in the destruction of local incomes and assets, placing an economic strain on local residents, who in turn place pressure on local natural resources, particularly forests, to survive. The problems affecting Georgia’s forests are characterised by poor oversight and unsound high-level practices. These have been the driving forces behind the last 20 years of deforestation in Georgia. However, the tragedy of the situation in Kvemo Svaneti is that the destruction of some of the most biologically diverse virgin forests in Europe is driving not only economic stagnation, environmental damage and youth migration, but that it is forcing the residents into a situation where they become reinforcing contributors to the problem. Until there is a viable economic alternative to the logging and subsistence farming industries in Kvemo Svaneti it won’t be possible to break the cycle of economic degradation and environmental devastation. This entry was posted in Georgia and tagged forestry, Georgia, Kvemo Svaneti, soviet union, Svaneti. Bookmark the permalink.